Tasting our way around the World Showcase while experiencing as many new and different foods as we can. Fortunately my DS, Peter enjoys trying new foods too. We'll be using our snack credits and sharing the tapas sized portions. 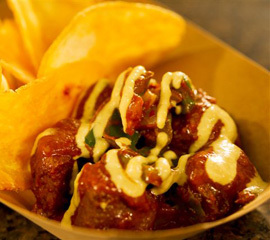 I am looking forward to checking out the new Terra Vegan Marketplace and the Chili Colorado with House Made Chips. 12. Florida Local – NEW! 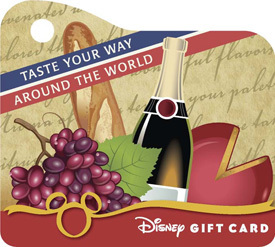 ►The "Taste Your Way Around The World" theme should make for a really neat display in front of Spaceship Earth. I wasn't too thrilled with past displays but I am looking forward to photographing this one. ►Shopping, one of my favorite pastimes in Disney and tops on my list this trip will be checking out all the festival merchandise and country specific merchandise. My first stop will be The Festival Center which has everything from bottles of wine to kitchen gadgets. I always find the neatest things there. My favorites last time were a F&W insulated tote bag that can double as a camera bag and a corkscrew that came in handy back at the resort with a bottle of wine we picked up that day. Oh, and the cookbooks! I can't wait see the festival cookbook! ► Eat to the Beat Concert Series - What could be better than listening to good music while munching on tasty treats? Speaking of treats check out this video from Disney Parks, it is too cute!